Yesterday, The Legal Genealogist wrote about the proposal before the Federal Communications Commission to repeal net neutrality. Today, in a 3-2 party line vote, we lost. Net neutrality — for this moment — is dead. Now there are those who wonder why we as genealogists should care. Here’s the bottom line: with net neutrality, the cable companies and wireless firms like Comcast, Verizon, AT&T and others — have to treat all content on the internet the same way. Without it, they can charge more to a content provider like, say, The Legal Genealogist, to show up in your daily email or on your screen, and charge you more for access to, say, Netflix. With net neutrality, FamilySearch as a free website on one side, and your choice of Big Genealogy Subscription website as a pay service on the other side get treated equally: both get the same right to send data out on the web, and you get access to both the same way. Without net neutrality, the service providers could throttle the free one back in favor of the paid service, or make you pay more for one than the other. 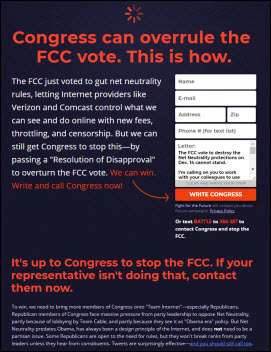 The only hope to keep net neutrality is now in the hands of the Congress. If you want to help, the website to learn more is Battle for the Net. Otherwise, December 14, 2017, goes down in the history books as the day when, in a 3-2 party line vote, net neutrality died. Did he just publicly say that it was ‘corrupt’? She (Jessica Rosenworcel) has described the process as corrupt because of the use of fake identities to file comments on the proposed rule. See here. I am so confused on this issue. I hope you are wrong. Especially if congress votes for repeal (too). I have just read a couple of articles that provide a completely different perspective. And basically, the common theme is that government regulation isn’t doing us any favors. And, net neutrality is actually the opposite of what it proposes – actual neutrality/even playing field. Yes, I get that. But why would it do that if another company (say a smart start-up) could enter the marketplace and offer everything Comcast used to offer (under “net neutrality)….but fails to offer now without a higher price tag? I can see how it could go the other way. But I’m totally anti Comcast. I despise that company. Its hard to believe it could get worse. But, I know it always can. Again….confused. In most areas (mine for example) there is no competition to Comcast. Nobody has the assets to build the system to compete. Again, the existing net neutrality rule isn’t a guarantee that every player will be equal. It simply keeps the playing field more equal than it would be without it. In a fight between Google on one side and Comcast on the other… I’m going with Google. Hands down. Yes Judy. I grew up in a rural area…. I believe you may be correct. Government control allows companies like Comcast to operate as regional monopolies, thus cutting out competition and allowing them to charge what they want. When do we get to dump that government control? Till we do, Net Neutrality is GOOD government policy to repair damage done by other government policy. The area I live in has a couple of other alternatives to Comcast….which I’m thankful for. I used to be under their thumb in my last residence – and I vowed “never again”! Life is good without Comcast….but if there is not choice….people don’t need to be screwed double. Replying to Erica L: Comcast has not been granted a monopoly by the Federal government. It’s a monopoly because it dominates local and regional markets, by (in the past) gobbling smaller cable companies and using its size to discourage competition. It takes a lot of money to compete with Comcast, by putting in lines and serving a large enough area to get the economies of scale to compete on price. State and local governments would be delighted to have competitive telecommunications markets, but large providers like Comcast and AT&T are quick to slap down competition. It’s easy to blame the government, but the real blame should be on the companies which have contributed lavishly to Senate and Congressional campaign funds, and the laws which permit it. A lawsuit is being filed. The FCC should lose this in federal court. The President appoints FCC members, so to change them you have to elect a different President. That carries its own issues and risks with other policies. Sadly, genealogy is impacted by politics these days. I don’t think this clear cut. There are many industry leaders, a Nobel Price winning economist, the inventor of the internet and several civil rights groups who do NOT want the additional regulation of full net neutrality. It’s better to go slow on regulations, particularly in a fast moving industry. There are lots of technology advances and will continue to be so. We need to make sure there is strong competition in every market. We don’t want the build out of internet access to slow down. You would have to be very gung-ho to put your trust in the network operators. I have worked for a software company that risked having its application blocked because the provider was trying to extort money from them. That sort of tactic is illegal at the street level. We should not give up – there will be lawsuits filed and we can help by donating to Organizations like Common Cause, which is already asking for donations, and I am sure the ACLU and others will be fighting this. I just received a similar message (2:33 pm) from the ACLU with a petition to call for a Congressional Review. If you care about this issue act now. Americans pay much more than many other countries for Internet, cellular service, groceries, education, pharmaceuticals, healthcare, etc. This is why socialism is being fully embraced by Millennials. They are going to have to clean up a heck of a mess that’s being left for them to inherit. This is just one more example of it. Restore what freedom? The freedom to discriminate against a competitor’s products by making yours free and theirs extra cost? The freedom to make consumers pay extra for services like Netflix? Sure. Net Neutrality = Control. Repealing it restores the free market upon which this country has thrived and the atmosphere in which the Internet grew by leaps and bounds for the first 15 years of its existence. Why in the world would anyone want a government to control this is beyond me. The government screws up everything it gets it’s hands on. It has become oppressive, in our personal lives and in our business lives. They control virtually everything and force us to comply with the thousands of pages of regulations on the books with the threat of fines and punishment. Keep them out of our lives. We are already regulated to the nth degree. Remove regulations — don’t add to them. Someone commented on a completely different post that people don’t remember what life was like before net neutrality, implying that none of the readers were using the Internet before 2009. I do remember, all too well. At that time ISPs were prioritizing their own content over anyone else’s, and it was (to me) 90% garbage. Just like a certain former ISP’s current news page, my ISP concentrated heavily on the entertainment world with such “must-read” articles as who’s sleeping with whom, what designer’s dresses are worn most often at the awards ceremonies, and other such earth-shattering “news.” That might have been okay in the days of dial-up services when we really did have a choice. Now, though, as has been pointed out, many if not most of us do not have a choice of high-speed service providers. No, the federal government hasn’t granted a monopoly; the local governments have through their franchise agreements. In my area the only available cable provider happens to be Comcast, but it could easily be Cox, Verizon, Frontier, or any number of other companies. I don’t know if DSL is even an option, but (a) it’s not up to the same technological level as cable and (b) CenturyLink is no more honorable a company than Comcast. There are really two sides of the problem — the consumer side and the provider side, both pitted against the carriers in different ways. On the provider side, I have no problem with paying different fees for different access speeds — but two companies shouldn’t be charged different amounts for the same access. On the consumer side, I think the ultimate solution is to separate the carriers (those providing the transmission hardware) from the content providers, similar to the way the electric utility industry has been deregulated.